FOR a veteran NBA team with multiple championships under its belt, getting some rest is clearly more important than the race for the best overall record in the NBA. That was exactly the case Monday night at the Energy Solutions Arena, where the San Antonio Spurs played the Utah Jazz without their Big Three of Tim Duncan, Manu Ginobili and Tony Parker, who did not travel with the team. 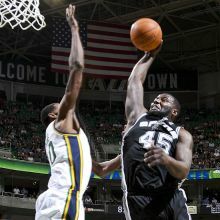 Minus the prolific trio, Utah defeated San Antonio, 91-84. The loss not only snapped the Spurs' 11-game win-streak, it also dropped their won-lost record to 40-15, a nose behind the Oklahoma City Thunder, who are the best in the West with a 42-15 slate. The 43-14 Chicago Bulls are No.1 league-wide. With a brutal of stretch of five games in seven nights, Spurs coach Gregg Poppovich decided to rest his star starters, a decision he described as a "no-brainer." Obviously, the Spurs don't care about playoffs seedings, they only care about being healthy. The 6-foot-10 Duncan is still getting it done with 15 points and 9.2 rebounds per game, but he has 14 years of NBA toil on him and he's turning 36 this later this month. At 29, Tony Parker only has 10 years of NBA mileage, but the wear and tear of countless playoffs wars is taking its toll as the speedy point guard has missed four games this season with wrist and right calf issues. Though back in the lineup after a 30-game absence due to a broken hand, Ginobili is still not 100 percent. And at age 34, he's no spring chicken, either. All these puts so much sense on Poppovich's decision. San Antonio, after all, has already clinched a playoffs berth and some rest now might bode well later for the Spurs as they make one more push for an NBA title following a condensed, lockout-marred season. Utah also wasn't at full force Monday night as Josh Howard (knee), CJ Miles (left calf strain) and Earl Watson (torn medial meniscus) were sidelined by various injuries. But Devin Harris (25 points and six assists) provided enough firepower to topple the Spurs while Paul Millsap added 18 points and 10 rebounds. Gordon Hayward chipped in 16. Gary Neal and Tiago Splitter paced San Antonio with 14 points apiece, but there was little offense elsewhere for the Spurs, who struggled with just 40.2 percent from the field (35-of-87 shots) and 29.2 percent from 3-point range (7-of-24).